If you like this free game, try Toy Defense. 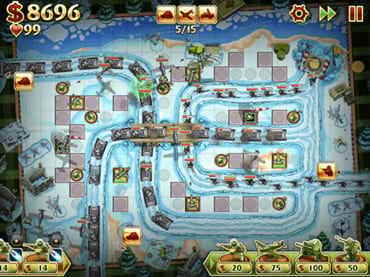 Experience the life of a true soldier in Toy Defense 2 - the long-awaited sequel to the multi-million downloaded tower defense hit! Set in WW2, this action-strategy game is packed with more levels, amazing new features, big selection of fighting units for each world and more battle action than ever. Take part in various missions in a range of theatres of war from the picturesque Normandy beaches and forests to the North African deserts. Most epic battles of WW2 are waiting for you! Recruit troops, upgrade and manage units to create your own powerful army! Defend your base, fight off the invading enemies and develop your own winning strategy! The outcome of the war is in your hands! - Two play modes: casual and hard. If you have questions about Toy Defense 2 game, please contact us using this form.